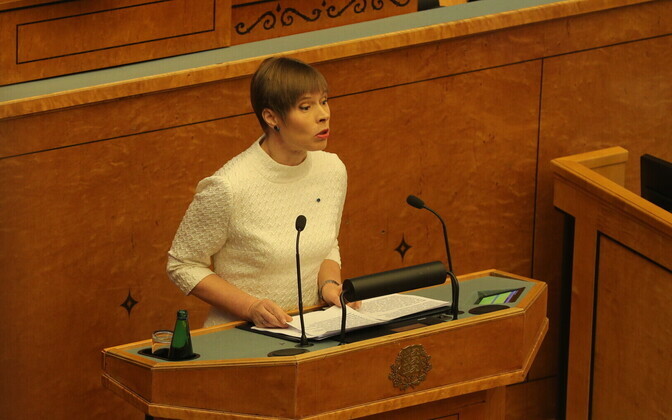 All MPs are here as a result of democratic processes, and Estonia does not have a crisis of democracy, President Kersti Kaljulaid said in a speech delivered at the inaugural sitting of the XIV Riigikogu. Nevertheless, it has a crisis of values — why else would, a month after the elections, a significant portion of the people feel as though something has been broken in Estonian society, and as though certain agreed-upon limits no longer seem applicable? 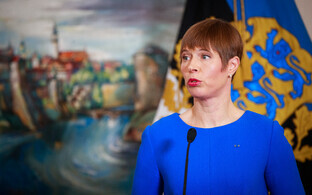 Courtesy of the Office of the President, ERR News has reproduced Ms Kaljulaid's speech in full. Let us be honest: we are facing complicated times. As has been the case throughout the history of our country. Our place on the map and our population size inevitably tend to keep matters complicated for us at all times. It is easy to make mistakes, and as one of the smallest European countries, we will never have enough strategic depth to be certain that mistakes will not threaten our survival. 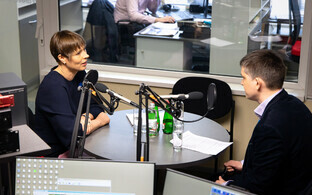 Therefore, we must be sincere when assessing our situation and all together sincerely seek the best future for Estonia. All together, for all the people of Estonia, for all Estonians and all others who also hold Estonia dear. I very much agree with those who say that this house that we have hastily managed to build in 30 years has quite a nice view from the penthouse and is tastefully furnished. But the sun does not shine into every room. I understand those who would like to tear this building down and start all over, hoping that there will be a sunnier corner for them in the new one. The development of our society in the last 30 years, in which we have managed to regain about half the 50-year economic lag that we developed due to the occupation, has been a success story. However, besides the rapid growth in productivity and income, this success has had another side — the resulting social changes have been painful. As I have said time and time again, we have been inept in balancing society, especially via social policy measures. On the one hand, Estonia's transformation is inevitable — urbanisation, the loss of jobs in the rural economy, an uneven increase of income. All developed countries have experienced the same. For us, these processes have been extremely rapid. The catch-up speed has been high, but the adverse side effects have accordingly been more complicated as well. It is clearly impractical to demolish what we have built and to start fully from scratch, even though it may result in a considerable redistribution of the resources in society, as often happens in the event of sudden changes. But as we know and witness at least in one of the large EU countries at the moment — it results in confusion and economic chaos. As I noted, due to our location and population size we probably lack sufficient strategic depth to ensure that demolition efforts do not jeopardise the survival of our state. In economic terms, we are also among the European average. Thus, the fall-back arising from the demolition work would pose for us a much more serious problem than for some very wealthy country. So, "No!" to revolutions! Let us be conservative! A true conservative is someone who is able to sufficiently assess ongoing and upcoming changes in society and balance them in such a way that we never need a revolution! Let us keep what we have and speak honestly about what to do better from now on by building, not by tearing down! Let us recognise our success as an e-state! We are proud of our role in the European Union and NATO, not merely as a member but as an active and dutiful contributor. 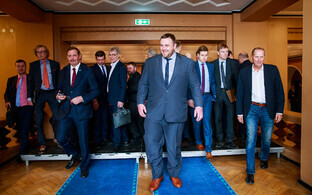 Let us recognise and thank all those Estonian politicians who have led us so far. But let us also be honest about how to improve the functioning of society. Prosperity and happiness will not reach all Estonians without effort. Given our current productivity, the life in the countryside no longer offers as many jobs as it did 30 years ago, and none of us want those collective farm jobs anyway, because low-productivity work does not pay well. Yet we do have ideas on how to balance differences in regional development. It is easy to understand that not a single cent of the decreasing EU support can be spent in the capital; rather, we need to fix up remote village roads. The division of corporation tax in such a manner that also local authorities benefit more from business in their territory will certainly be of help. We must vigorously stand for maintaining and, in some cases, re-establishing our county centres as strong centres that are able to provide everything that a person needs throughout their lifetime. I am still convinced that local leaders still have a long way to go in providing their residents with social guarantees at a level that, given the prosperity of our country, we should already be able to afford. Indeed, it has taken too long for local leaders to realise what their duties are, but their inability is not merely their own fault — suffocating and uncoordinated ministerial bureaucracy often plays a great role here. Social seclusion can be witnessed in the capital and in other larger centres, too. Poor language skills attributable to the fact that we still do not have a network of kindergartens and schools where the language of instruction is Estonian is one of the key factors in this regard. It is no privilege to remain languageless in a country where one works, be it temporarily or permanently. The continuance of the bilingual school system for an unspecified time poses a threat to the lasting of the Estonian language and culture and does not in any way increase the social cohesion of Estonia as a country. We have one official language. It is our responsibility that all children moving from kindergarten to school are able to speak it, not to mention those who are about to finish school. Much needs to be done and the economic opportunities created in 30 years allow us to actually serve all the people of Estonia. Serve also those whose concerns have led them to wanting to demolish and start from scratch. If we act together and with integrity, we can glue our society back together. But this calls for honesty, a sincere will to understand everyone, the ability to notice the negative side effects beside the advantages of one's political decisions, and the willingness to reduce such negative effects. Today's major geopolitics are not favourable to us either. The biggest risks of the present world for the United States, our largest ally of global force, lie elsewhere and are related to China and, more broadly, Northeast Asia. The only reason why the United States would wish to spend its resources in our region for the purpose of ensuring our security lies in shared values. The values written on the Jefferson Memorial in Washington, in the Declaration of Independence of the United States and, likewise, in our Declaration of Independence and in our Constitution. Section 12 of the Estonian Constitution states that everyone is equal before the law. No one may be discriminated against on the basis of nationality, race, colour, gender, language, origin, religion, political or other views, property or social status, or on other grounds. Incitement to ethnic, racial, religious or political hatred, violence or discrimination is prohibited and punishable by law. Incitement to hatred and violence between social classes or to discrimination against a social class is also prohibited and punishable by law. And so forth. The entire Chapter II of the Constitution describes to our people the freedoms safeguarded by the Constitution in all their diversity. Formulating, among other things, that there is no censorship and that science and art and their teachings are free. That everyone has the right to abide by his or her opinions and beliefs. Naturally, the other side to every formulated freedom is the responsibility for how we exercise our freedoms. Freedom of speech does not justify lying. Drawing justified attention to risks is not fearmongering. Disagreement is not betrayal. Disagreeing with someone else's opinions does not give one the right to call them stupid. An inconvenient question asked by a journalist does not need to be answered where one does not know the answer or does not want to answer, but one cannot ban asking questions. Otherwise, Estonia would no longer be among the champions of free media. News accounts of course should not contain an opinion. Facts and comments should be clearly apart. It is the journalists' sense of responsibility that keeps us among the champions of free journalism. Chapter II of the Estonian Constitution is especially clearly dedicated to democratic values. It is the bond that keeps us in a value space shared with all our allies. It is the nucleus text of the Estonian state which proves to the entire world that we belong to free Europe. It is a text that is sacred to everyone who serves the Estonian state as an official, politician, serviceman, police officer, teacher, doctor, journalist or artist. It is a text without which our state would not be free and without which the people in our country would not be free. And this text is also our security guarantee. The spirit of our Constitution is alive when we use democratic values as citizens and patriots of Estonia and let others use them as well. All worldviews are equal before the Constitution as long as they are not in conflict with the general rights and freedoms set out in the Constitution. The bearers of each worldview are welcome to participate in the political process and compete for seats in the Riigikogu. Having reached this house, every member of the Riigikogu is free within their mandate and can follow the Constitution and their own moral compass. Should the latter two conflict, the Constitution naturally prevails. 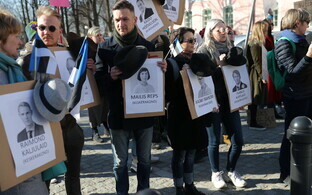 What is happening in our Estonia today is a functioning democratic process. There is nothing wrong with democracy in Estonia. It was the voters' responsibility to put together a new composition of the Riigikogu, and the voters delivered. Elections were held, the winners are clear, the political parties are free to discuss their possible governmental cooperation and each member of the Riigikogu is free to assess candidates for the position of the Prime Minister. 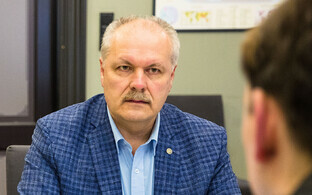 As President, I do not have the right to assess what the support of the members of the Riigikogu to one or another candidate for the position of Prime Minister might be. 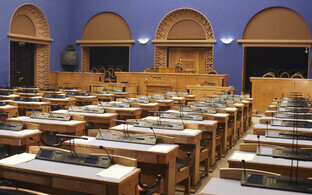 The only way to identify who has the support of the Riigikogu is through this hall. It is natural that the political party that won the elections can be the first to begin seeking support in this hall. Today, the XIV composition of the Riigikogu commences work. Everyone who is here is here as a result of democratic processes. Estonia's democracy works. Still, we should ask why, a month after the elections, a large portion of the people feel as if something has been broken in our society. Certain agreed limits no longer seem applicable. It is not a matter of worldviews but often of elementary politeness and respect. Of respect towards each other and the people. Indeed, we do not have a crisis of democracy. The elections and the following events are procedurally in compliance with the Constitution and democratic values. Nevertheless, we have a crisis of values. The freedoms and values described in the Constitution as well as the defenders of those freedoms and values are attacked under various pretences. Those whose work is to defend values and freedoms are also under attack. Those who express their opinion as citizens to safeguard our freedoms and values are ridiculed, too. Those who feel that previous ways do not meet their needs and are therefore sceptical of freedoms and values are teased and ridiculed as well. If we let this continue, our democracy will also soon be in a crisis. By then it will be too late. What can we do? Lead by example. To help you in this endeavour, allow me to share a little personal memory of mine. This memory has always supported me when I have stood in this very place or before a committee or faction of the Riigikogu as President of the Republic or in another role. 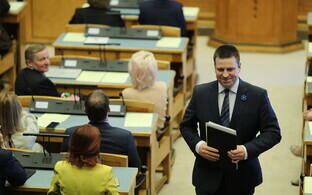 In 1999, a minister came before the Riigikogu with a plan that the minister sincerely believed in and that the minister considered necessary for improving things in Estonia. The discussion in this all did not prove too constructive. Or, perhaps, the plan was bad. I cannot quite recall. But the minister was sad not because the plan did not fly. The minister felt that this hall had attacked him as a person. Had called into question their common since and even appearance. 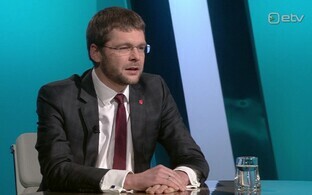 Discussing the matter, Eiki Nestor, the former Minister of Social Affairs, said: Listen, dear friend, please remember this one thing forever, or at least as long as you are a minister in the Republic of Estonia. Because it is a very important thing, the most important thing of all. Namely — when you speak in front of the Riigikogu, you are always speaking to your people. Never to merely this hall here. Never to the person who asked you a question. Never to the person who mocked or insulted you or commented on the shape of your nose when asking a question in this hall. From this platform, you are speaking to your people and only to your people. That "old hippy" [previous President of the Riigikogu] Eiki Nestor is not here today. Greetings to him on the island of Hiiumaa! But thank you, Eiki! I am certain that many people in this hall remember some lesson taught by you about the pains and troubles of representative democracy which helps them represent the people while they are a member of the Riigikogu and talk to the entire country from this platform. Good luck! Let us respect each other and our people!